I prefer to be down closer to the ocean floor in relatively shallow waters. I like a variety of fish and invertebrates. I’m one of the most popular food fishes in the Atlantic! Because I was such an important food source, I played an important role in history as European settlers learned to sustain themselves in North America. You can recognize me by my greenish-brown color and my barbels on my chin (they look kind of like whiskers). I think they make me look distinguished. We were important predators in the ocean, but unfortunately our numbers have been dropping due to overfishing. 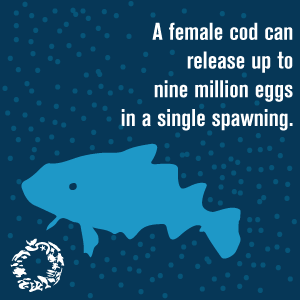 This makes the ecosystem get out of whack—since there’s not enough of us to eat enough prey (such as urchins, shrimp and lobsters), the prey populations are expanding like crazy! I can change color! Depending what depth I’m at, I can go from a grey-green color to a reddish brown. You can just call me the chameleon of the sea. I have my own place in history books! We were a really important food source for Native Americans and European settlers in North America. Native Americans shared some fishing tips and tricks with settlers in the 1600s, allowing them to sustain themselves through eating fish (mostly cod). We were probably even there for the first Thanksgiving! Word has it that we used to be so abundant you could scoop us up in buckets from the boat. Fishing pressure increased dramatically—which was great for early traders who shipped salted fish back to Europe, but bad news for us. 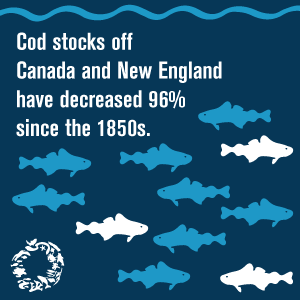 Generations of harvesting and increasing sophistication of fishing methods led to plummeting stocks; in the 1990s, the Grand Banks cod fishery actually crashed! Moratoriums were put in place in some areas, but lots of stocks are still in rough shape and don’t seem to be rebounding.